Melissa Murphy with her children Gerald, 3, Caroline, 2, and Jack, 10 weeks old. Melissa is in her last semester of studies at the University of Illinois at Chicago Hospital to earn her Doctorate of Nursing Practice. She was nominated by her husband. 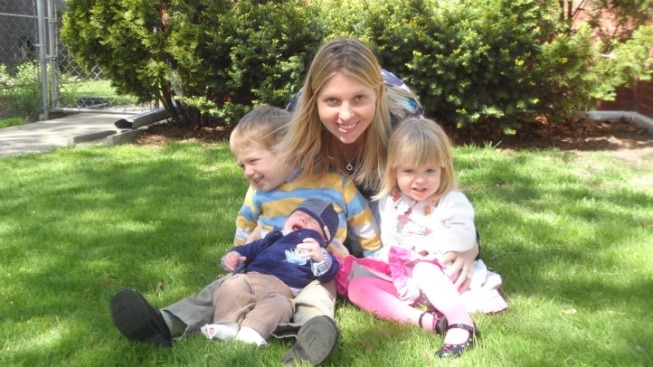 Melissa is a fabulous mother to our three children: Gerald (3 years old), Caroline (2 years old) and Jack (10 weeks old). She also works as a full-time Nurse Practitioner at the University of Illinois at Chicago Hospital on the Near West Side; and, is in her last semester of studies towards earning her Doctorate of Nursing Practice. She is tirelessly energetic considering all that we have going on in our personal life with three young children and her demanding work and study schedule. In addition, our youngest son Jack was born with club feet and is currently undergoing repeated castings on both legs but will ultimately need surgery to correct the malformation of his Achilles’ tendons. This procedure will be followed by the necessity for him to wear braces on both legs until he is two years old. Our eldest son Gerald was born with the same condition; however, he successfully came through it all without any relapse and thankfully has not missed a step in his physically development. In her position at UIC, Melissa works in lower intestinal and bariatric (weight-loss) surgery. Between visits with patients in the hospital, both pre and post-operation, along with shifts in the hospital’s clinic and handling patient follow-up obligations, she can see an excess of 50 patients a day. When she does get home, the second job of helping to raise our family picks back up; sometimes without any extended pause until she is back at the hospital the next day. In addition to work and our family life, Melissa is in the midst of concluding her fifth year of part-time studies necessary to receive her Doctorate of Nursing Practice. She is currently taking her final class but she must also complete 300 residency hours and a doctoral research project. The focus of her project is to examine the benefits of additional psychological assistance that could be provided to middle-aged Hispanic and African-American women who are candidates for weight-loss surgery. I hope that you will consider her for this contest because with such little time to unwind in the evenings or over the weekends, giving Melissa the opportunity to enjoy some quiet time so she can relax, recharge and even be pampered would be a welcome relief, both mentally and physically, for her.